Photo by Tim Jarrold for SpeedwayMedia.com. “Oh Canada” is Canada’s national anthem. However, some might be saying, Oh Brother, instead, after another wild finish at Canadian Tire Motorsport Park. For PG references, that’s what was going on between the minds of KBM teammates Todd Gilliland and Noah Gragson after Gragson made a move in the last turn of the race, spinning Gilliland and taking both of them out in the process, for the win. Neither could recover to win and fell back to finish ninth and 11, respectively. Noah Gragson and Todd Gilliland collide as Justin Haley speeds to the win at Canadian Tire Motorsport Park. Photo by Tim Jarrold for SpeedwayMedia.com. With the incident, it saw 2018 playoff driver Justin Haley break through and take the checkered flag for his second career win in the series and his first at CTMP. Qualifying took place in the rain yesterday evening and with that, it saw playoff drivers, Ben Rhodes and Noah Gragson on the front row. As the race began with Stage 1 being 20 laps, the action was fast and furious from the start. Rhodes got out to the lead, but Gragson followed him closely behind until he took the lead on Lap 7. From there, Gragson dominated and went on to win the first stage. There were a couple of incidents without yellows due to the nature of the road course. Jordan Anderson spun around, Stewart Friesen spun, and Myatt Snider spun around after contact with Johnny Sauter. With the road course being long enough and allowing drivers to get back to speed, there were no cautions for these incidents. Stage 2 got underway on Lap 24 and went to Lap 40. After falling back shortly on the restart, Gragson was able to take the lead once more on Lap 25 and he held on for nine laps. The second caution of the day came out on Lap 32 for the 20 of Max Tullman who stalled on the track. This saw playoff drivers, Sauter and Grant Enfinger pit for strategy and track position. Unfortunately, Enfinger’s truck pulled the gas can with him and was penalized for removing equipment, and had to serve a stop and go penalty. The restart came with six to go in Stage 2. With no more incidents in the second stage, Gragson collected his ninth stage win of the year. After a lengthy cleanup and caution, the final stage resumed with 16 laps to go. Sauter took the lead on the restart from Gragson. However, another caution flew for the 22 of Austin Wayne Self who spun out after contact with Friesen and John Hunter Nemechek on the backstretch. After the restart with 13 to go, Gilliland took the lead two laps later. Gragson passed Rhodes and Enfinger for second. But, a caution came with four to go after Wayne Self had contact with Jason White in Turn 3, setting up NASCAR overtime for a two-lap restart. As seen in recent history, most finishes come down to the very last lap and the very last turn and that was the case again for this year’s running at CTMP. With the contact made between the teammates, Haley scored his first ever win at CTMP and advanced himself into the Round of 6. There were five cautions for 18 laps with six leaders among eight lead changes. 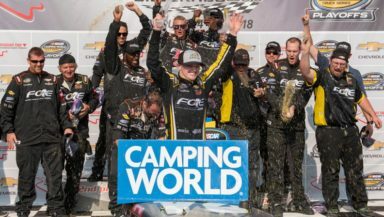 There will be a two-week break for the NASCAR Camping World Truck Series until the series returns to Las Vegas Friday night September 14 for the second race in the Round of 8. Here’s where the rest of the playoff contenders finished in the annual running of the Chevrolet Silverado 250.